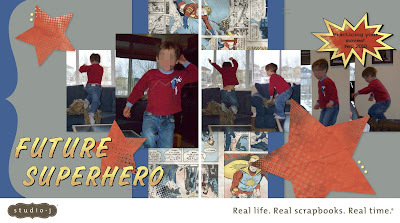 My Studio J layout feature for this week uses the kit "Superhero" which is also one of the new paper packs from CTMH in the Spring/Summer 2012 Idea Book. I created this layout digitally in Studio J - - but you could also re-create this with the scrapbooking paper kit! (The Cricut Art Philosophy cartridge has great star shapes to choose from and the Hero Alphabet stamp set is the perfect font!) Love this kit for little boy layouts! My pictures feature my little boy perfecting his Superhero moves while jumping around on the family room furniture. I'm constantly reminding him that furniture is not for standing/jumping on -- but on this particular day I just had to laugh and pull out my camera as he had the time of his life jumping from couch to table to chair and back again! Too funny!! Boys will be boys, right?!? Thanks for stopping in today! Enjoy the rest of your weekend! You can shop my CTMH Website HERE! Try Studio J for free HERE! What a darling layout. Nice to know those papers are available in studio j. I think I will have to use them at some point.